As this fiscal year is coming to an end, we would like to inform HOKUSAI users are needed to submit “Usage Report”. If project fails to submit the annual report, members of the projects will not be allowed to use RIKEN Supercomputer after the next FY. The Usage Reports will be disclosed at Archives of Usage Reports. 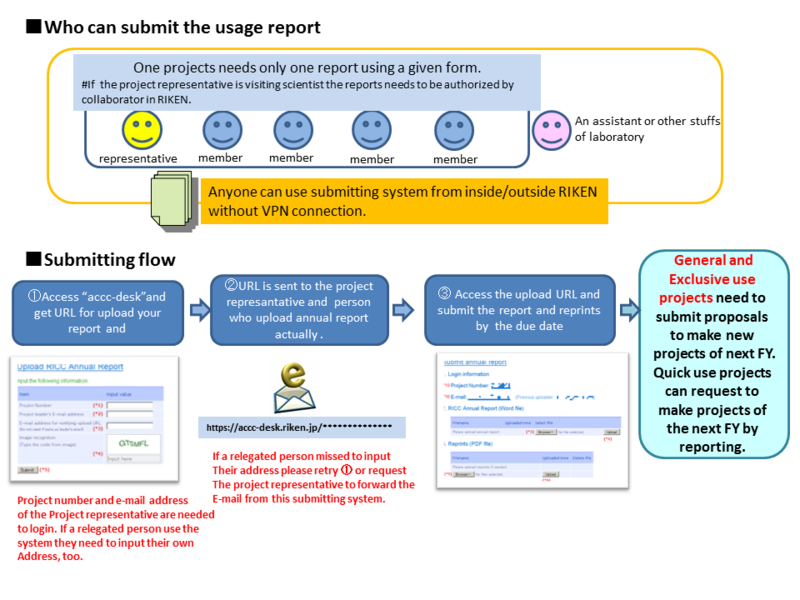 Usage Report have to be submitted by each project not by each account. Quick Use project can request to make the next FY Quick Use project in the submitting process. If your project do not use Supercomputer in this FY, please describe the reason why you did not use Supercomputer in the Usage Report and submit it. You can download the Usage Report form from the following. If reprints or preprints of the publications listed at the Publications List in the Usage Report are available, please submit them. The deadline for submitting the Usage Report and reprints is 5:00 PM (JST) on February 13, 2019. Since the application system will be closed automatically at the deadline, please complete submitting process including upload in advance with a margin by the deadline. Please submit the Usage Report and the electronic files of the reprints using Online Submission System. The URL is given below, and you can access the system from in and outside RIKEN. and submit the Usage Report. “Project ID” and “e-mail address of the project representative”. We cannot accept submitting by e-mail. representative and supervisor before submission.